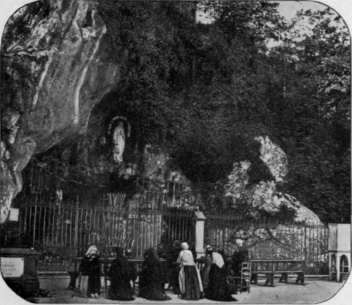 Descending to a point below the church, and entering the grotto where these miraculous manifestations are said to have occurred, I saw before me, in a niche of the rock, a statue of the Virgin surmounted by the words which she is said to have uttered: "I am the Immaculate Conception." 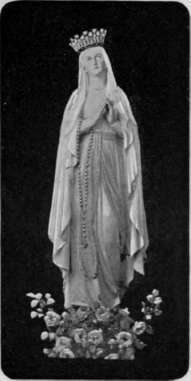 Near this, also, surrounded by a marble coping, is the miraculous fountain which is said to have gushed forth in obedience to the Virgin's command. I never failed, in repeated visits, to see a crowd of people kneeling before this and imploring the aid of Mary, while the rock itself is garnished with hundreds of canes and crutches, the thank-offerings of those who claim to have been cured by the water. 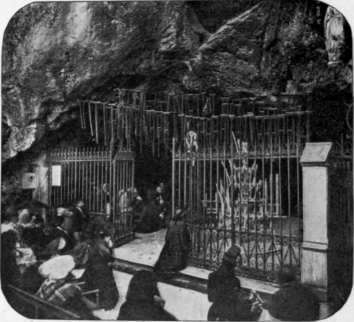 It was Sunday morning when I first approached this grotto, and the place, which is always more or less full, was then thronged with kneeling worshipers. The water of this fountain has been chemically examined, but whatever natural virtue it has, beyond that of simply pure water, is too subtle to be discovered. Nevertheless, during the summer of my visit, the number of pilgrims to Lourdes averaged fifty thousand per month, and, for the benefit of absentees, the healing waters are now sent forth to various parts of Europe, like those of the Apollinaris and Selzer springs. In summer special trains are run to Lourdes bringing thousands of invalids and pilgrims, together with many tourists who avail themselves of the cheap rates to make a visit to the Pyrenees. Zola, in his recent novel, "Lourdes," gives of these throngs of pilgrims some of the most graphic descriptions he has ever penned. Canes And Crutches In The Grotto. Above the grotto is the church which the priests built in obedience to the Virgin. It is in some respects the most singular sanctuary I ever saw. Turning my eyes toward the roof, one hundred feet above the kneeling worshipers who filled the nave, I could see nothing but a mass of variously colored silken banners suspended from the ceiling, as triumphant proofs of the reality of Bernadette's vision. Moreover, the chapels, and, in fact, most of the walls of the church are covered with gilded hearts, medallions, and votive tablets of white marble - all testifying to miraculous cures effected by the sacred spring. How history repeats itself in different ages and in various lands! Votive tablets like these are nothing new. They have been found in ancient temples by the Ganges, amid the ruins of Carthage, and in the crumbling shrines of Heliopolis and Palmyra; and in every case the grateful donors thought they had been cured or saved by the different deities to whom their supplications were offered. 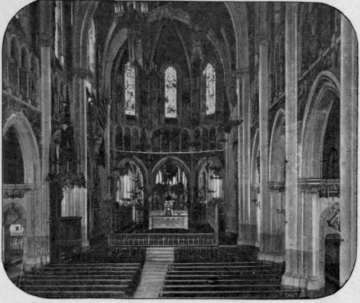 Interior Of The Church At Lourdes. From a practical point of view, the vision of Berna-dette has proved a blessing to her townspeople. Almost every barber, shoemaker, and grocer here has a sign over his door, declaring that his shop is dedicated to the "Lady of Lourdes," and, near the grotto, are many shops and booths where all sorts of religious relics and trinkets are offered for sale. I am sorry to say, however, that the morality of the place is not of the first order. In one of these shops a lady of our party had her pocket picked, while in another a similar attempt was made upon my own. The relatives of Bernadette, who herself died in a convent a few years ago, are the most fortunate of the villagers, for they turn their relationship to pecuniary profit. Thus, over the door of one shop I read, "This is the store of Bernadette's aunt;" over a second, "This is kept by a cousin of Bernadette;" while a third bore the seductive notice: "Here you may see the girl who was present with Bernadette at the third apparition." So many thousands of pilgrims visit Lourdes every year that the hotels are flourishing. In one of them at table d'hote I found two separate companies, each with a different menu; a meagre bill of fare being provided for the saints and a more elaborate one for the sinners. Candor compels me to acknowledge that, indifferent to my reputation for sanctity, I chose the table where I could get the best meal.